Home » Baseball » Is This the Strangest Baseball Card of All-Time? Is This the Strangest Baseball Card of All-Time? The hobby has seen its share of strange cards over the years. From Photoshopped presidents to squirrels to vocabulary lessons courtesy of Billy Ripken's bat, baseball cards can be home to the truly bizarre. But are collectors ready for the first Sadako baseball card? The Ring was a hit at the North American box office in 2002 (although the 2005 sequel was a dud). Based on the 1998 Japanese horror film, Ringu, the franchise has continued to be a draw at the international box office. Now it has spawned one of the strangest baseball cards off all-time. Sadako 3D, the latest installment in the J-horror series, has been a hit in Japan since its release in May. Sadako, the titular star, threw out the first pitch at the April 25 game between the Hokkaido Nippon-Ham Fighters and the Chiba Lotte Marines at the Tokyo Dome. Sadako is a ghostly character with distinctive long hair that covers her entire head. Think of her as an emo version of Cousin Itt from The Addams Family. Now Sadako is being honored with her own baseball card. It will be included in 2012 BBM 2nd Version, a set of Japanese cards. The set is scheduled to be released in August. BBM has honored other notable first pitch ceremonies in the past. In fact, according to Japanese Baseball Cards, BBM has been including a celebrity first pitch subset in 2nd Version since 2004. Besides former players, subjects have ranged from actors and actresses to Anime characters to scantily clad models. 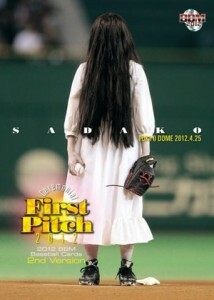 As one might expect with a "ghost" throwing out a first pitch, Sadako plays the first pitch with some absurd comedy. You can catch the full ceremony in the video below (skip ahead to the 1m 30s mark to see Sadako hit the field). 2014 BBM Shohei Otani. Rookie PSA graded 9. 1991 BBM All Star 62 Card Set, Nomo, Komiyama, Furuta etc.